Mirror photo by Shen Wu Tan Fred Saffold III, founder of The True Black History Museum, talks with people about the exhibit and the contributions African-Americans have made to society. A Luba Tribe headrest from the Congo, South African soil from Soweto, figurines from the Jim Crow era, a 1991 Jet magazine article about Whoopi Goldberg’s Oscar win and books written about black women, including Michelle Obama and Condoleezza Rice, who influenced the political landscape, were some of the artifacts on display at Penn State Altoona on Tuesday. The assortment of artifacts, which date from the late 1600s to the 21st century, was a way to teach people the value of black people, with a particular focus on women of color, according to Fred Saffold III, founder of The True Black History Museum. “We have to talk about the contributions of black people, especially of women,” Saffold said, commenting on how their contributions are not properly documented. “We started to profile the contributions of black American females,” he said of the exhibit at the university campus. “We like to romanticize the past. And we romanticize these images like Dr. King and Malcolm X, and these were the images that we fell in love with when we first started collecting. The True Black History Museum, a traveling exhibit, displayed a variety of figurines, signed memorabilia, photographs and novels among other items commemorating black historic figures and time periods. The collection includes more than 1,000 artifacts memorializing influential people such as Angela Davis, Rosa Parks, Oprah Winfrey, Serena Williams, Mamie “Peanut” Johnson, Mary McLeod Bethune, former President Barack Obama, Booker T. Washington and many others. It was founded in 2010 as a way to preserve the history of African-Americans and to educate others of the many contributions they’ve made to society. At Penn State Altoona, Saffold and his daughter, Janay Craft, brought more than 100 items from the collection, many of them highlighting the accomplishments of African-American women. Sue Patterson, the university’s assistant coordinator of diversity and inclusion, said the school wanted to bring an educational experience for the students to their own space. During his presentation, Saffold noted some historical figures and places including the Door of No Return on Goree Island in Dakar, Senegal, that used to be a port for slave traders, Queen Nzinga who fought off colonizers and the slave trade and Carter G. Woodson who is dubbed the Father of Black History. He also discussed how Jim Crow era figurines portrayed black women in a derogatory manner. Pointing to screen images of the artifacts, he said the figurines stereotyped them as “barrel chested” and always wearing an apron to depict servitude and showing the audience how that propaganda and those stereotypes still appear in today’s society. In order to achieve equality, Saffold said the dismantling of institutional systems built on racism and inequality is necessary. By acknowledging and recognizing black history, it not only leads to the restoration of an inner essence, strengthening and healing but also promotes respect, he added. 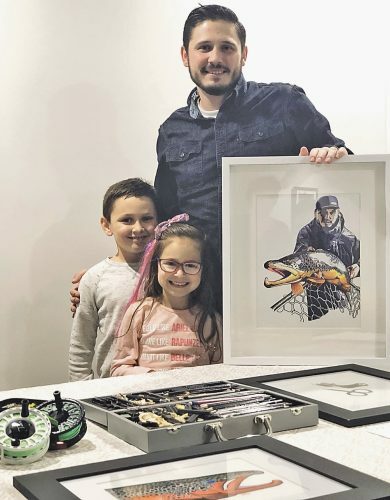 Jennie Miller, a Dun­cansville resident attending the event, said the exhibit gives exposure to black history that isn’t given much exposure to begin with. She said while African-American women were slaves, they also established child development and cooking practices they did not receive credit for. 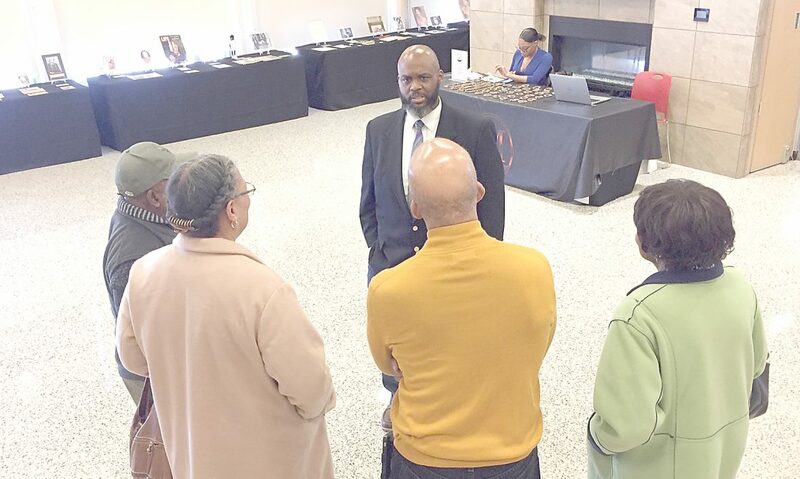 Another event attendee, Paul Johnson, said although February is marked as Black History Month, everyday is about black history for him and every day that history is being made. The Altoona resident and retired pastor said he takes pride in the history of slavery because it was the slaves who created many of today’s beautiful places. When visiting plantations in the South on his travels, Johnson said instead of seeing those enslaved in the past as slaves he sees them as apprentices who mastered the art of trades such as ironwork, masonry and carpentry. Toward the end of his presentation, Saffold asked the audience members to sit and reflect on their privilege. After a few moments of reflection, he then asked the audience to think about how to use that privilege to empower others and to eradicate systems of racism and oppression. The national tour of the The True Black History Museum began on Martin Luther King Jr. Day and runs into April. Penn State Altoona was the ninth PSU commonwealth campus that Saffold and Craft visited.